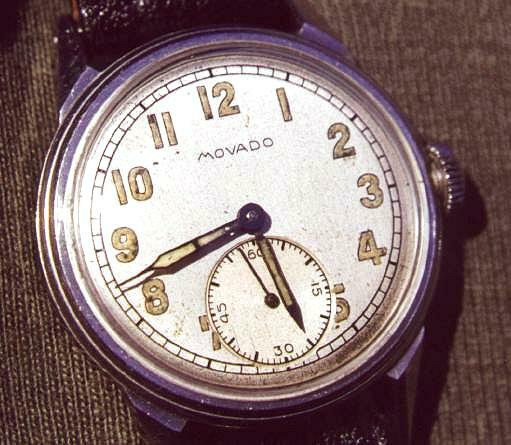 Here is a Movado from 1930s or 1940s. Case is stainless steel, with radium hands and hour numbers and silvered dial. It loses only a few seconds a day. Here is another picture of this watch. 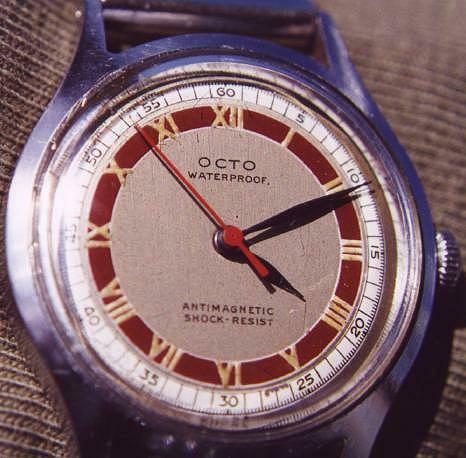 This is a beautiful wrist watch from 'Octo,' Swiss made. It is unusual for the overall style of watch, in that it has Roman numeral hours. I usually prefer the Arabic numerals, but I like the way it looks here, with the yellow painted hours contrasting with the maroonish red ring. The outer seconds ring is in white. Hands are blued steel. Watch runs great, but for some reason the whole apparatus rattles around in the case a bit. For more pictures, click here. 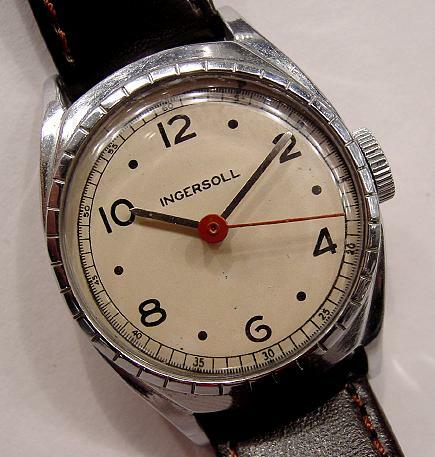 Ingersoll Mens 1940s or 1950s watch. This is a loud ticking inexpensive watch, with a clean dial and a nice red second hand. Dial is cream colored. Runs well, though it winds hard. Click here to go to a page with pictures of other Ingersoll watches. I have become marginally interested in cheaper American made wristwatches lately. Most of what you will see on this site are vintage Swiss, though some a few of these. This Ingersoll probably cost about $9. There is a story behind these 'consumer watches." These were meant to be reliable and affordable, if not especially fancy pants. They really fulfilled their purpose in allowing most everyone to own a wristwatch. The 'dollar watches' were pocket watches made around the turn of the century, by various companies, intended to cost no more than a day's wages. This took a while to realize, but when the first watch to be sold for a dollar was finally introduced, it made these consumer watches available to everyone. Waterbury Clock Company, later effectively turned into Ingersoll, later turned into U.S. Time, and finally survives today as Timex, the king of consumer watch companies. Westclox was another famous maker of inexpensive wrist watches, as were New Haven, Ingraham and some others. Kelton was a brand of U.S. Time, marketed heavily in France. 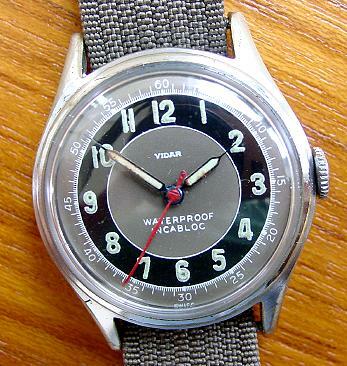 This generic 40s Swiss watch by "Vidar" has many of the asthetic elements I enjoy in a watch: Steel or chrome plated round case, arabic hour numerals, red central seconds hand, luminous hours and hands, outer minute track, and a dial with an overall high degree of cripsness and contrast. The black track really makes the look of this watch, and little touches such as the thin white line on the inside of the black, are nice features. This one runs well, Swiss 17 J. Incabloc refers to a form of shock protection for the balance staff of the watch.